Green smoothies rock my world! 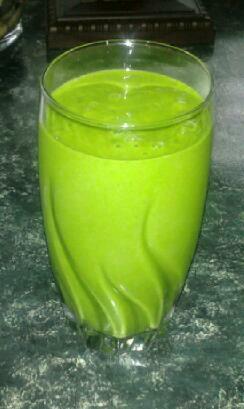 OK, maybe a bit over dramatic, but I love green smoothies. Being able to incorporate fruits, veggies, chia seed and micro greens into one blended yummy of a healthy drink is like sitting on top of the world. Still dramatic, but you get the point. Having a minimum of 1 green smoothie a day does wonders for the body. There are so many green smoothie recipes out on the internet, in raw food books and on 'YouTube', you are sure to find one that fits your taste buds. I enjoy watching people make smoothies on youtube. Many go through a step by step process that is easy to follow and quite mouth watering. Whichever recipe you use, just throw in a handful of ANY micro greens and you'll soon be rockin' too. I am only going to post 1 recipe here because it is my staple. I know raw foodist would not like it because I use frozen pineapple juice, but I shall post it anyway. You can always juice your own pineapple. Gel your chia seeds in the pineapple juice right in the blender, before blending all the rest of the ingredeints. To gel, add juice and seeds. Turn blender on lowest setting and 'stir'. Turn off and 'stir' again in a few minutes. Blend with a high powered blender like the Vita-Mix to make the smoothest smoothies. There is such a wonderful blended flavor developed when using a good quality blender. If you use one that doesn't blend smooth enough, you will get bits and pieces of greens, especially if you use greens like collards or kale, and the flavor is not at it's peak. Do yourself a favor and invest in the best and you will enjoy your Vita-Mix for years to come. And I do mean YEARS!